Boozy Banana Cream Pie Dip - A Sweet Dessert Dip for Fun! This boozy banana cream pie dip is exactly the dessert you are looking for! Just like your favorite pie with bananas but easier! Banana Cream Pie is one of the most amazing desserts around! I mean, who can resist a creamy pudding dessert full of bananas and studded with toasted coconut? All the best banana cream pies have a flaky pie crust too! How do you make Banana Cream Pie Dip? To make a banana cream pie you need to cook the custard, making sure to temper the eggs just right so they don’t curdle, then you need to chill down the custard before layering it with bananas in the pie shell. Lots of work, not that it is totally worth it, but who wants the same kind of dessert with a little less fuss? One of the other amazing desserts around is banana pudding. That same creamy pudding consistency, bananas, and vanilla wafers too! Are you on team vanilla wafers “in” the banana pudding or “on the side?” Some love the softening of the wafers and how they all mesh together. I prefer to keep my vanilla wafers on the side and use them to scoop up my banana pudding. Have you checked out my mind-blowing version of banana pudding? Back to easy banana pudding desserts! 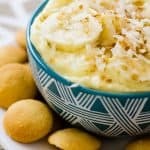 This Boozy Banana Cream Pie Dip is super easy, can be served as a dessert or an appetizer, and has a hint of rum in it. You might be wondering why I added coconut to the dip? I love a coconut cream pie, so does my father in law Larry, so when thinking about adding a little nip to the dip I went with Malibu Rum. Coconut in banana cream pie dip? 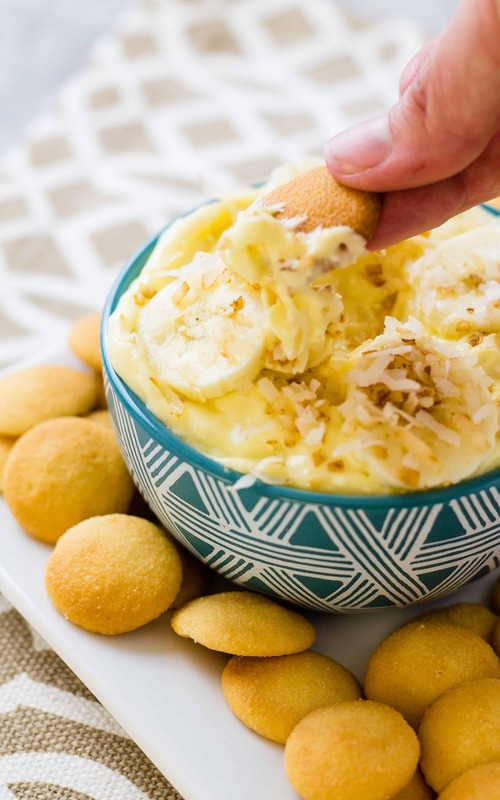 The coconut rum adds another layer of flavor to the banana pudding and allows me to sprinkle some toasted coconut on top of the dip for texture. Just like spiking the eggnog with rum, my banana cream pie dip shines with a bit of rum. If kids are coming to the party, you can make another batch and leave the rum out or just add it to half the recipe after you make it and serve in a “21 and over” serving bowl! Fun for all ages! My boozy banana cream pie dip is easy to throw together thanks to the instant pudding. Just mix the prepared pudding, whipped topping, cream cheese, bananas, and the other few ingredients and you are ready to go! Just in time to start dipping those vanilla wafers in it! Oreo Cookie Dough Dip from Bowl Me Over! 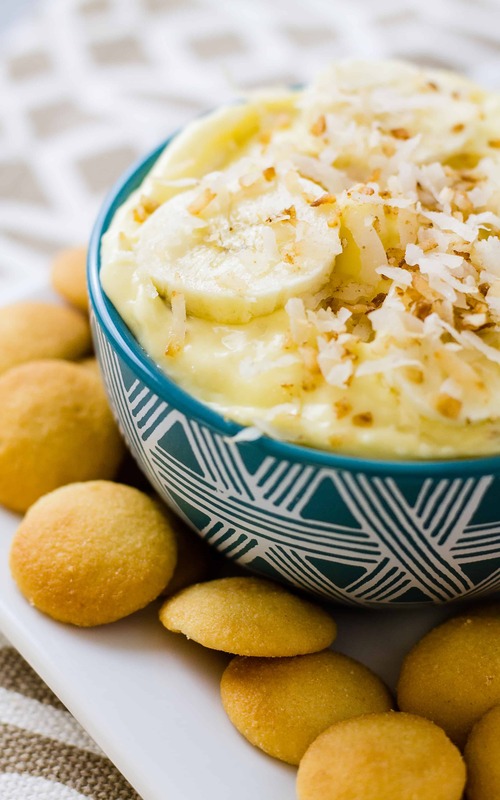 If you love bananas you will go bananas for this Boozy Banana Cream Pie Dip! No fuss with a pie crust and easier to make! This boozy banana cream pie dip is exactly the dessert you are looking for! Just like your favorite cream pie but easier! Start by making the banana pudding. Mix the pudding mix with 1 cup of milk. Stir in the whipped topping until combined. In a separate bowl mix the cream cheese, rum, vanilla, and powdered sugar. Combine the cream cheese mixture and the pudding mixture. Mix in half the banana. Place the dip in a serving bowl. Garnish the dip with toasted coconut and the remaining banana. Serve with mini vanilla wafers. What are some of your favorite banana desserts? Some of mine include these Banana Pudding Pops from A Kitchen Hoors Adventures, this Banana Fosters Banana Bread from Seduction in the Kitchen, and this amazing Banana Cream Jelly Roll from An Affair From The Heart because it also has toasted coconut! « Cannoli Cheese Ball – A Crazy Way to Eat Cannolis? Pinned, and I absolutely can’t wait to make it for an upcoming party… It sounds absolutely wonderful!! I would faceplant. I would eat the whole bowl and have no regrets! Ohhhh you had me at boozy haha! I would never have thought of this as a dip and now I can’t wait for friends to come over so I can make it! Ooooh, love this!! I think there would be a fight around that platter of goodness! Anyone who loves banana cream pie is going to love this recipe!! 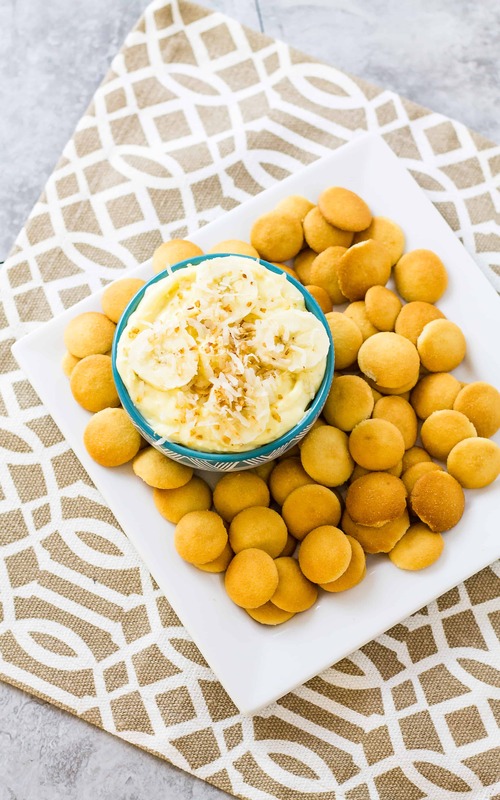 Banana cream pie dip is such a fun take one of our favorite pies! My brother is going to flip when he gets here today to watch march madness…. I just know he will devour it! I love to make banana pudding from scratch but love the shortcut with the instant! Me too! I love a shortcut when I don’t have extra time! This sounds SO good and I love how easy it is to make! It would certainly be a hit at any party! At the bottom and see no ingredient list or recipe. You talk about using instant pudding but no recipe. Sorry, you were having trouble seeing the recipe. It’s at the bottom of the post, just scroll all the way down. 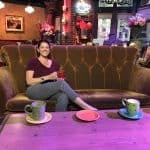 Thanks for being a reader!